Hitting up the beach this weekend? We recommend soaking up the sun in what's guaranteed to be the best $45 you'll spend all season: this celebrity-approved T-shirt from Madewell. A number of your favorite stars—including Brie Larson to Lea Michele—can't get enough of the adorable tee, pairing it with everything from denim shorts to striped pants, so you won't have any trouble working it into your wardrobe. 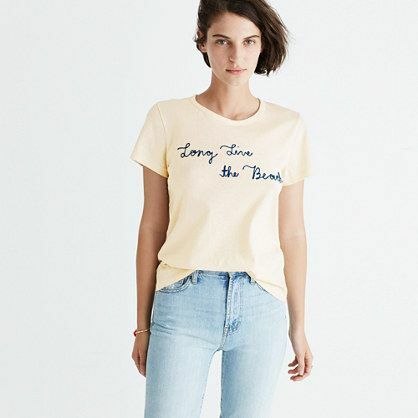 The best part is the limited-edition piece is part of Madewell's collaboration with the Surfrider Foundation, so all proceeds from sales will go toward the nonprofit's mission of cleaner oceans and beaches. If you're going out to the shore, why not help make sure it stays beautiful? Though most of the Surfrider line sold out quickly, you can still shop out a few items still available on the site below. The comfy tee goes with everything. Stand out in bold green sunglasses. This tote is perfect for a trip to the beach. Next up: the adorable $64 celeb-approved bikini.